Final details have all wrapped up on Twende Solar’s volunteer installed, 100 kW PV system at Shepherd’s Door women’s recovery center. This summer solstice, June 21, Portland Rescue Mission will flip the switch to solar and savings! 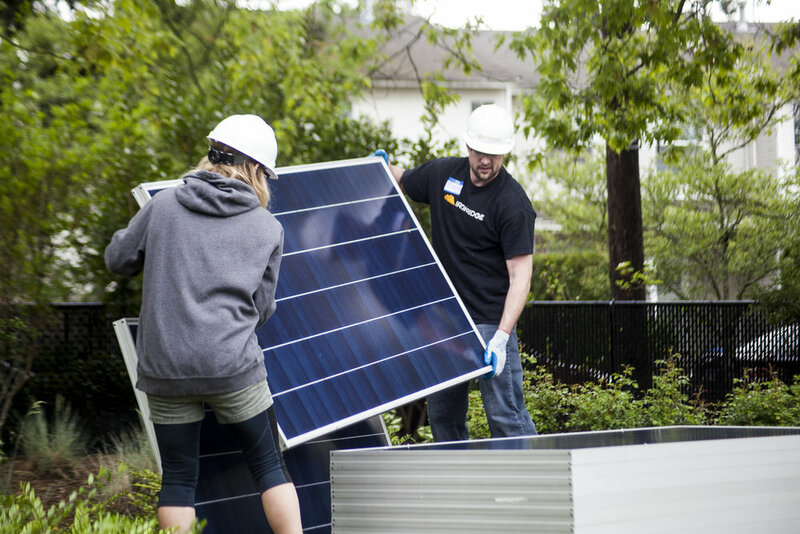 With more than 230 volunteer shifts for a total of nearly 1,600 hours, it took just over a month to complete an ambitiously large nonprofit solar install. Volunteers came together from four states, two countries, and more than eight competing solar contractor shops--all working side-by-side to empower the women of Shepherd’s Door. 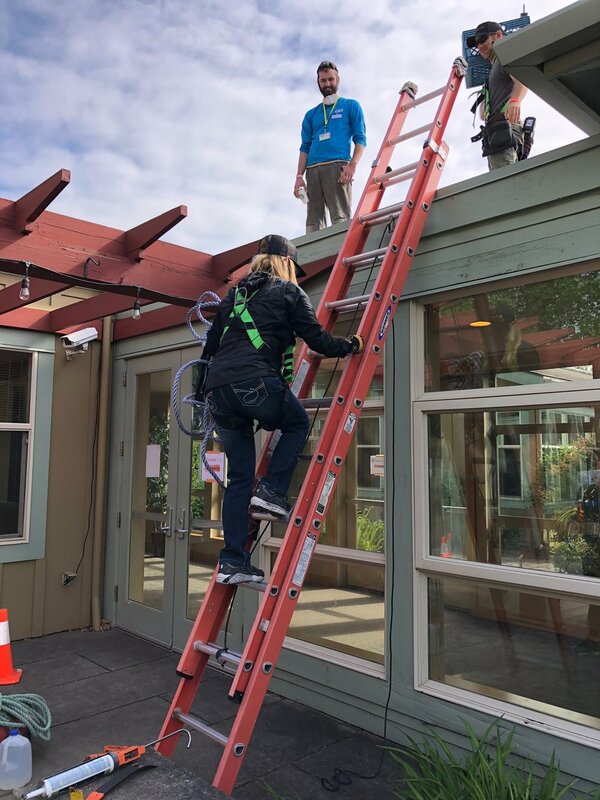 Twende Solar's first domestic project allowed donors, designers, sponsors and 130 volunteers to participate in an unprecedented 100 kW volunteer solar install to empower the women of Shepherd's Door recovery center. More information at www.twendesolar.org/portland. We owe a huge thank you to our friends and volunteers from Synchro Solar, Sunbridge Solar, Elemental Energy, LightSource Energy, Imagine Energy, True South Solar, Sunlight Solar Energy, EDP Renewables, Cummins Power Generation, HDR Inc., Portland State University, The Green Go Solar Project, OSEIA, EMA Architecture, Thriving Solar, Business Performance Improvement, New Legacy Construction, SunModo Corp., CED Greentech, Quick Mount PV, Neil Kelly, IronRidge, SunPower, DNV GL, Bonneville Environmental Foundation, The Ukraine, Washington, Idaho, California, Ashland, Corvallis, Portland, and many, many more. An all-star crew came together for a great cause! Such an overwhelming outpouring of support from the local community meant that we were unable to get everyone involved that wanted to take part, but confirms our suspicions that there is an unquenched thirst in the local renewables community to give back. Twende looks forward to continuing to make that connection between those who wish to give back and high-quality projects with significant impact. Producing more than 100,000 kWh of electricity each year, the 100 kW system will keep 2,000 metric tons of carbon dioxide out of the atmosphere and save the Portland Rescue Mission more than $300,000 over the next 25 years. Shepherd’s Door is a sanctuary of peace and security for women and children (ages 10 and under) who are seeking to transition into healthy lifestyles while dealing with the pain and destruction addiction caused in their lives. This recovery center is one of the few sites in the region that works to reunite families during the recovery program so they are able to restore life as a family. The Portland Rescue Mission offers programs ranging from five weeks to a year or beyond to help individuals and families attain success. In keeping with this tradition, Twende pairs skilled installers and engineers with solar enthusiasts who may or may not work in other parts of the industry but have a desire to get hands-on experience. Additionally, two residents in recovery were selected for mentorship and solar installation training during construction. After learning the skills of the trade, the environmental and financial benefits of renewable solar energy, and the need for skilled people in the trades industry, both women were inspired to pursue electrical pre-apprenticeship programs. As the solar industry continues to grow and be a leader in job creation, the future is bright and the women have an in-demand career to look forward to. Another part of the Twende Experience involves volunteers connecting with the communities in which we serve. 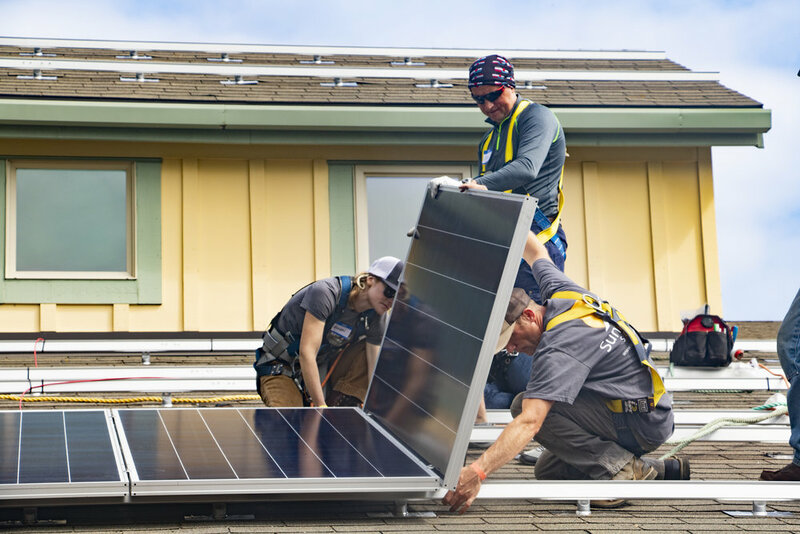 One volunteer had the opportunity to spend a day on the roof with two of the women residents and use his skills to teach them how to install solar. We could not have had such successful outcomes without considerable support from our project sponsors. Either through deeply discounted or generously donated supplies, storage space, designs, or shipping, the following sponsors made this project feasible for Twende Solar and the Portland Rescue Mission: SunPower, IronRidge, Yaskawa Solectria Solar, EATON, WESCO Renewables, QuickMount PV, Platt Electrical Supply, RRC Companies, Elemental Energy, CED Greentech, Imagine Energy, Bonneville Environmental Foundation, Form 7 Productions,and New Legacy Construction. We are very thankful for their support and look forward to future collaboration. If you were part of the project please leave us a note in the comments section regarding your experience. We look forward to hearing from you!